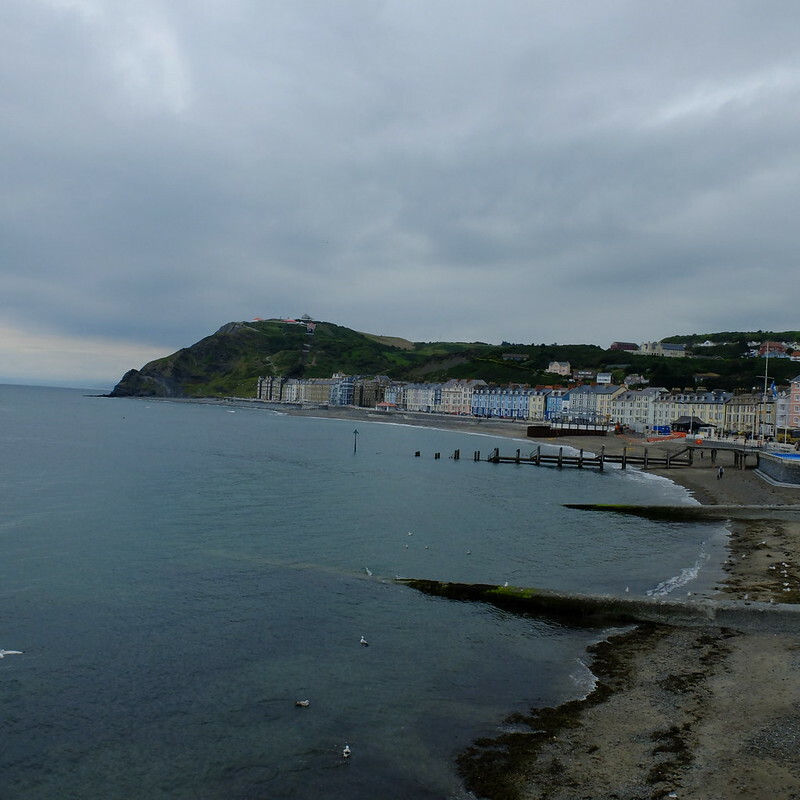 My tourism promotion of my lovely homeland Wales continues today with a feature on the mid-west seaside town of Aberystwyth (click here to hear the pronunciation!). I was in the town for a few days with a career development programme through work, and took the opportunity to head up a bit early so that I could enjoy the sights. 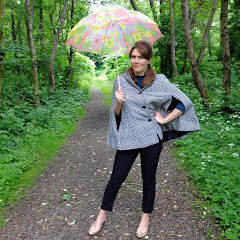 I took a winding route through Lampeter and Aberaeron and arrived at lunchtime, to cloudy skies and a bit of drizzle. 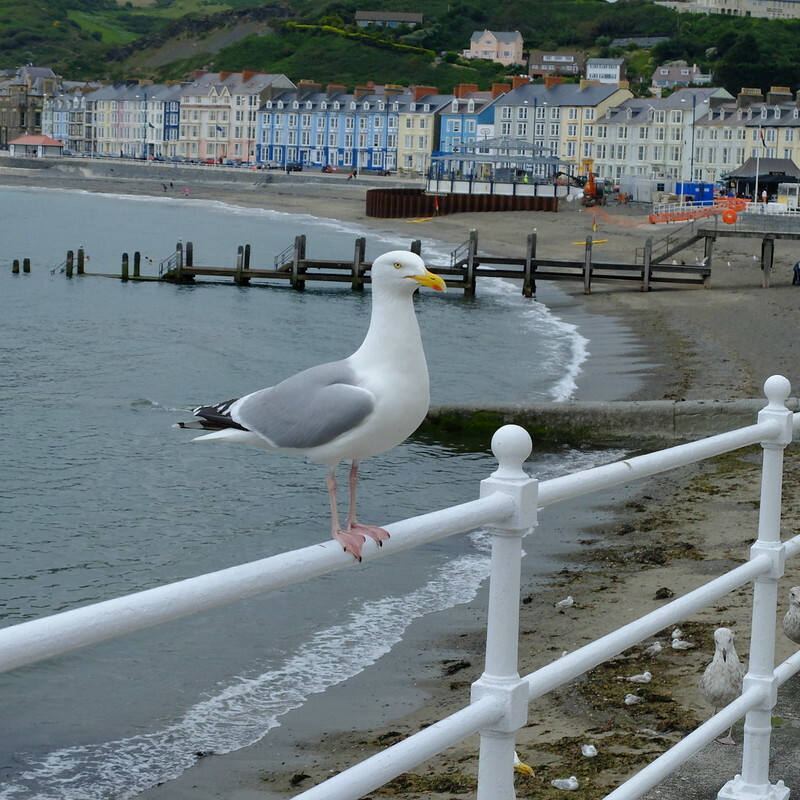 A university town, it has a pleasant sea front, and more pubs per person than any other Welsh town. 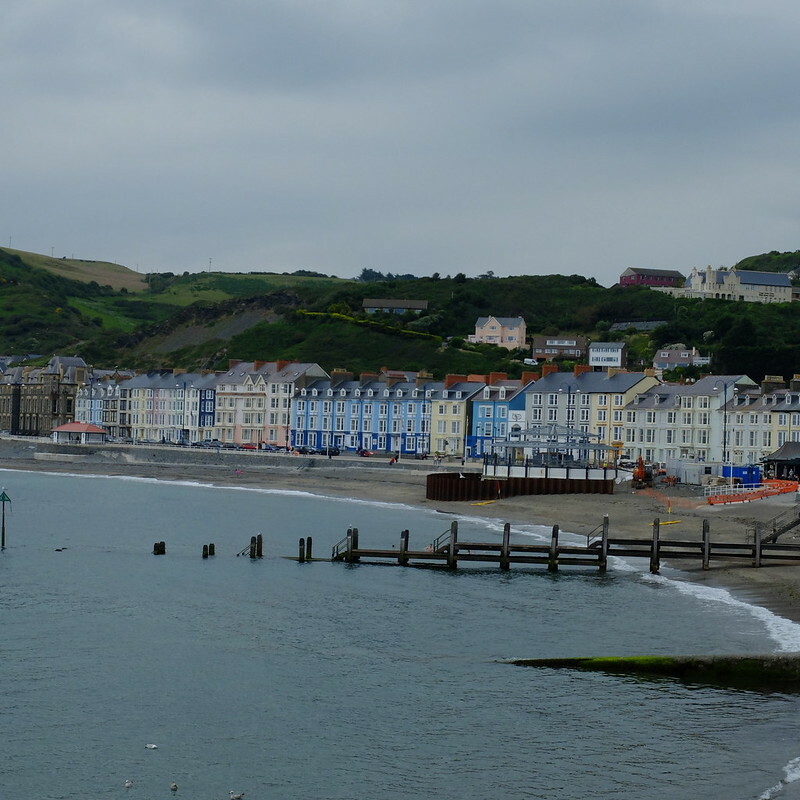 Aberystwyth's pier was apparently the first to be built in Wales, back in 1864. 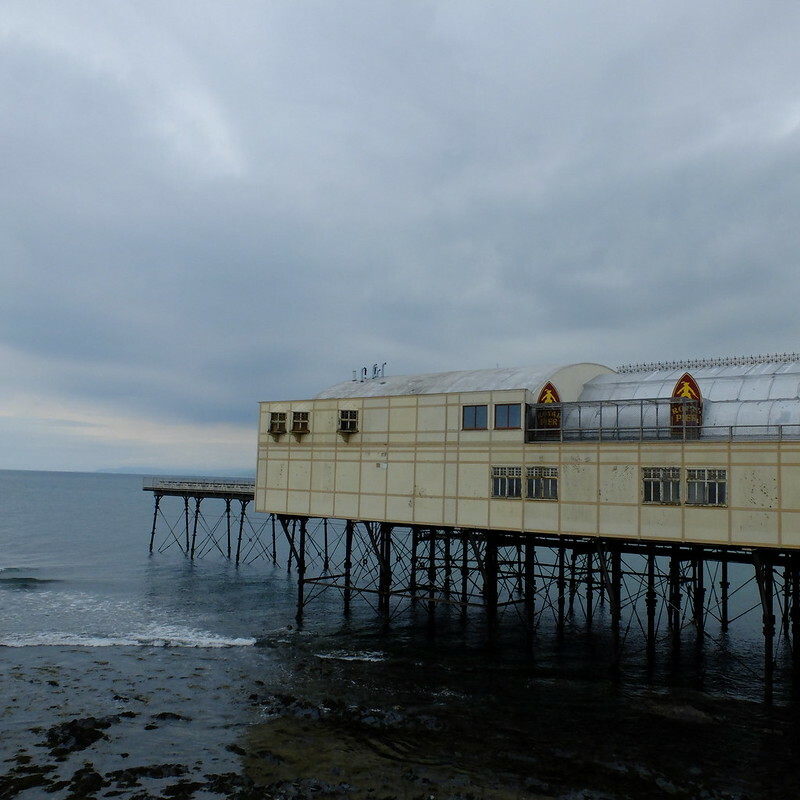 Half of it was swept away in a storm in the 1930s, so today it's a much shorter pier. I think it had lots of renovations and repairs some decades ago, but could do with a few more (it looks a bit grubby in person!). 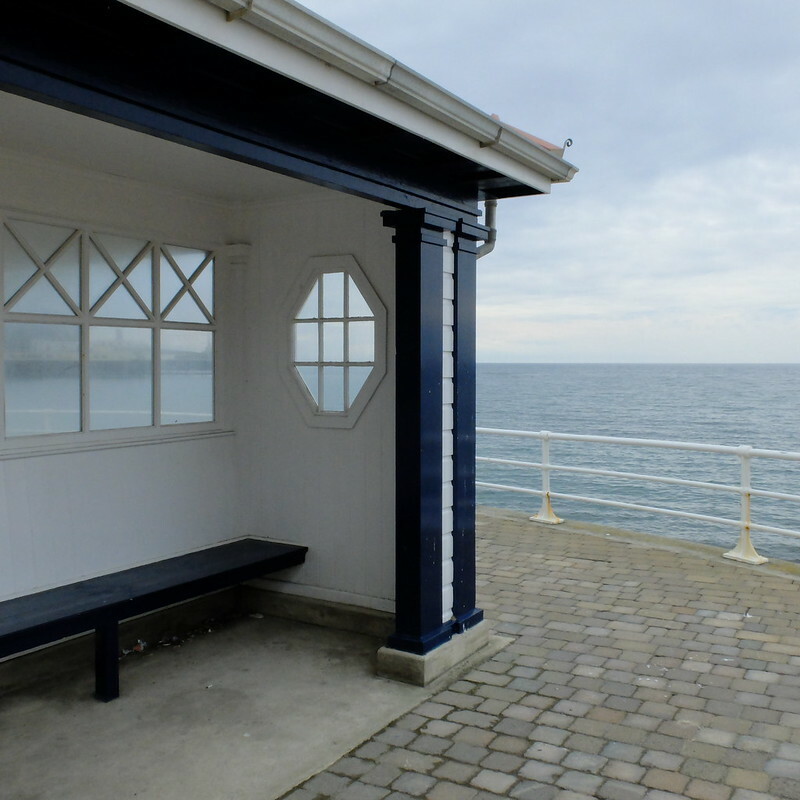 Stretching from the Victorian pier at one end to Constitution Hill at the other, the promenade is a lovely walk. A new bandstand is under construction midway across. I had a cheeky ice-cream whilst strolling along the front. 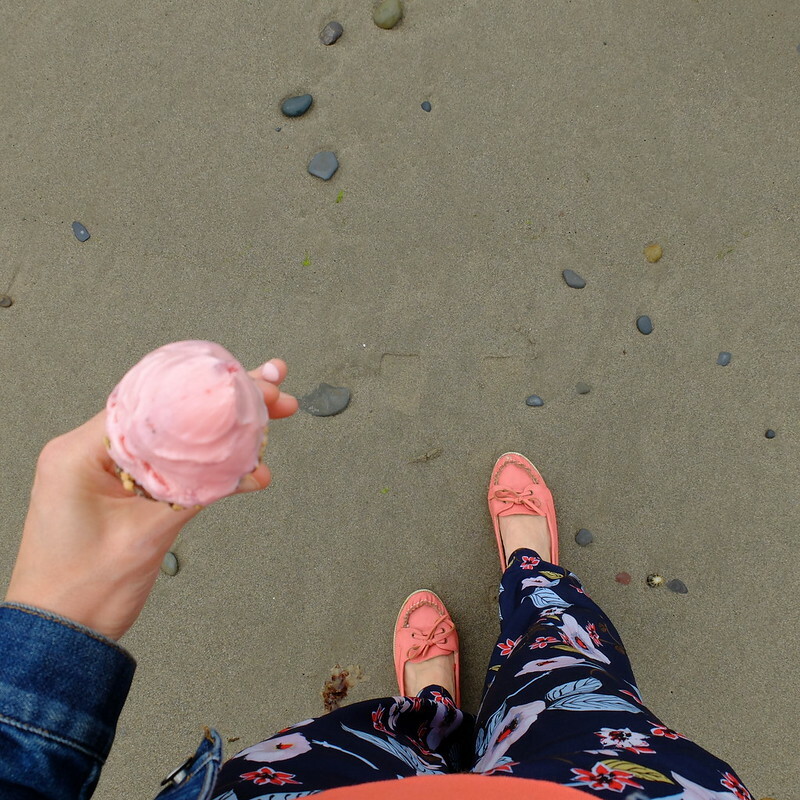 Those snazzy trousers reminded me of 1930's beach pyjamas, so I had to have them. £3 from the Primark sale rail. 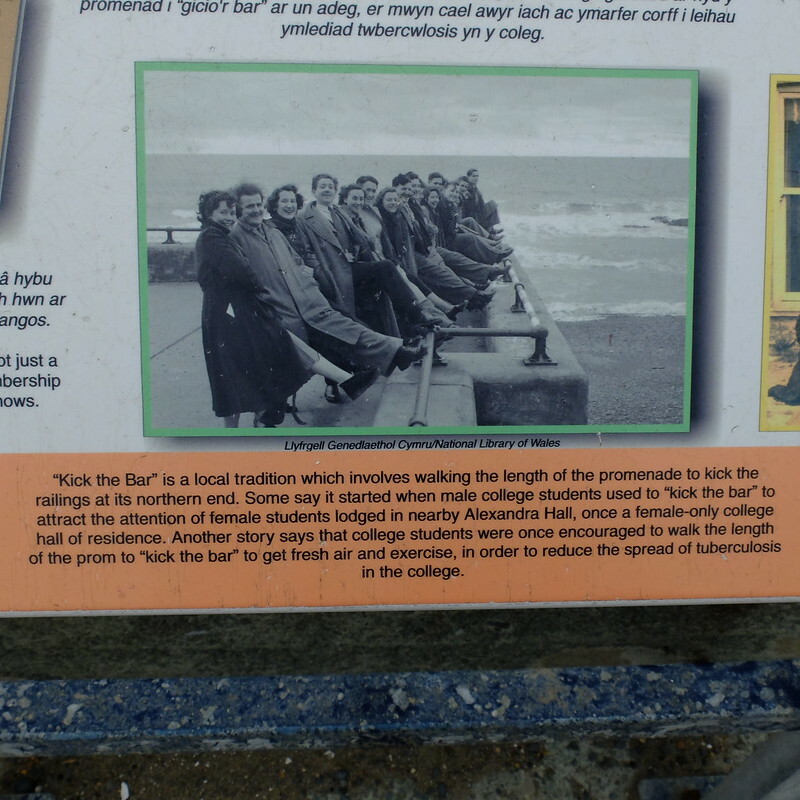 At the noticeboard at the end of the Promenade there's a lovely explanation of the tradition of 'kick the bar'. I've cut the explanation off slightly in the photo, but basically the railing at the end of the promenade was 'kicked' by students. It's not clear whether this was a ploy of the male students to attract the attentions of the female students in the halls of residence next to the end of the promenade, or if this was part of a initiative to encourage exercise to help fight tuberculosis. One of the first things that struck me as I walked along the promenade was the big hill at the end of it, and what seemed to be some kind of structure on top of it. Ever curious, I walked the whole length of the promenade to find out what it was, and was rewarded by the realisation that there's a cliff railway! It's £4 for a return ticket. You can walk up and down instead, but it's incredibly steep and there aren't always railings between you and the cliff edge, so it's not suitable for those unsteady on their feet or those with excitable children/dogs in tow. 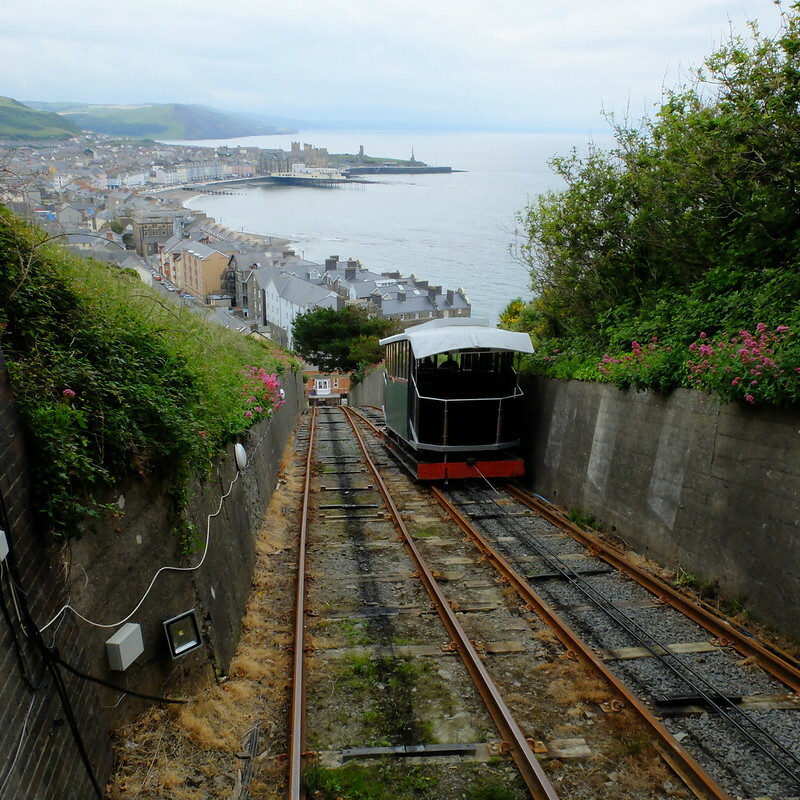 The cliff railway opened in 1896, at the peak of Aberystwyth's Victorian tourist trade. Originally, the hill would have hosted 'Luna Park', which would have had a bandstand, railway, ballroom and tearoom. Today at the top of Constitution Hill, there's a restaurant, and a Camera Obscura. The views are incredible. The funny thing was that the next night, work had arranged for us to have dinner...at the restaurant on top of the hill! So I went on the funicular again. It was a great spot for an event, we arrived at sunset and had the place to ourselves, which was probably for the best as there was some very enthusiastic African drumming later on in the evening that likely could be heard all the way down in the town. There are some good charity shops in the town centre, and a lovely selection of independent shops, including art supplies, bakers and giftshops. I was disappointed that Pretty Flamingo seemed to have closed down, as it was full of lovely vintage repro dresses at half price that I could only stare at through the glass with my nose pressed up against it. Too slow. I ended up buying two pairs of shoes from the charity shops. 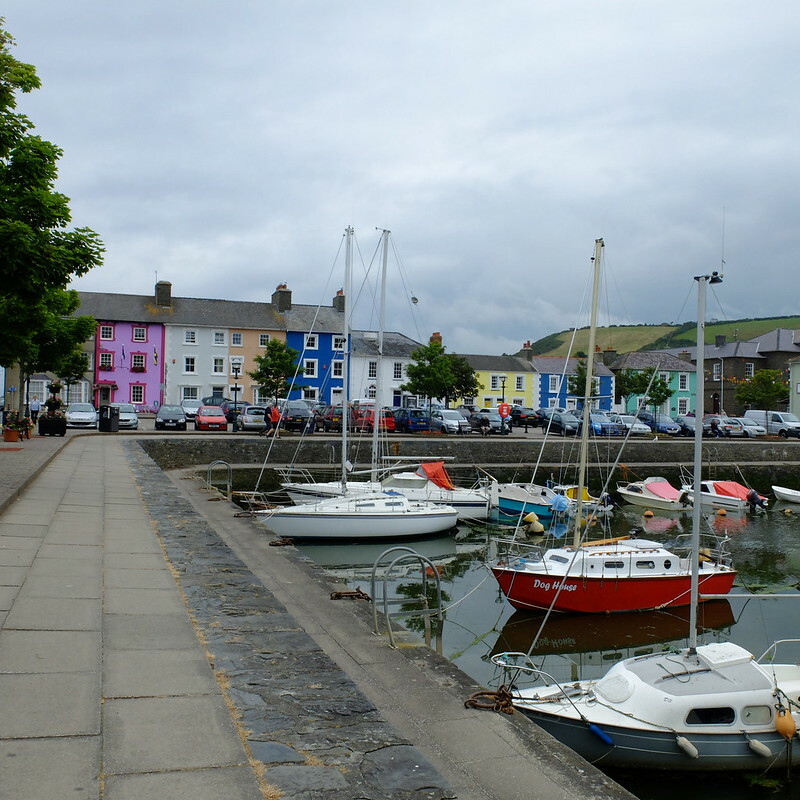 Also worth stopping at if you get the chance is the nearby seaside town of Aberaeron, which has a pretty little harbour. 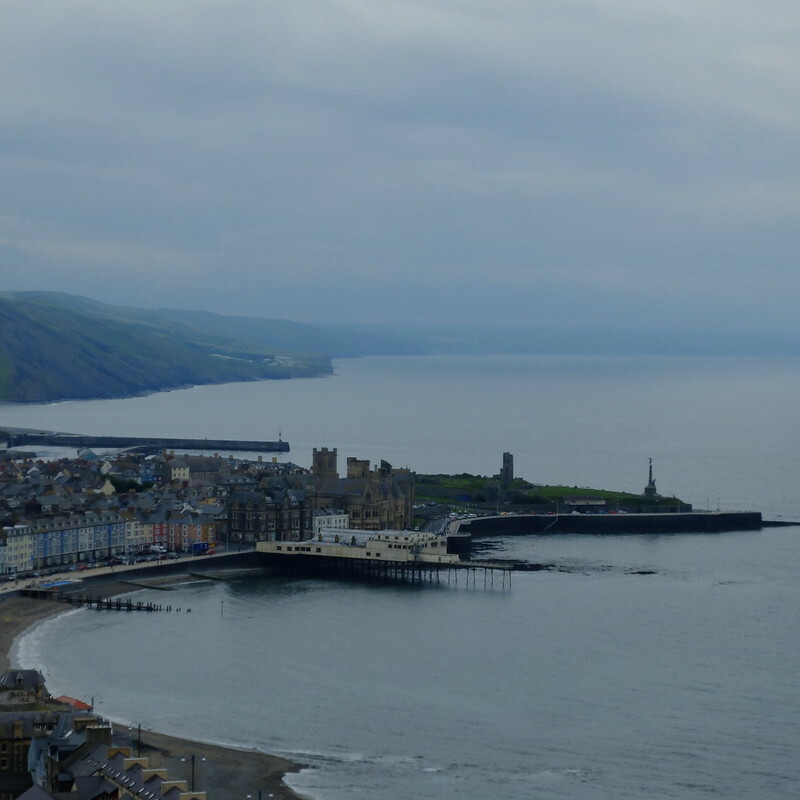 Have any of you been to Aberystwyth? Or even heard of it?! I went to university in Lampeter, so Aber was where we went if we wanted things like national chain shops, Burger King or the cinema! I still have the vase Mr Robot bought me as a birthday present there. It's a lovely town. 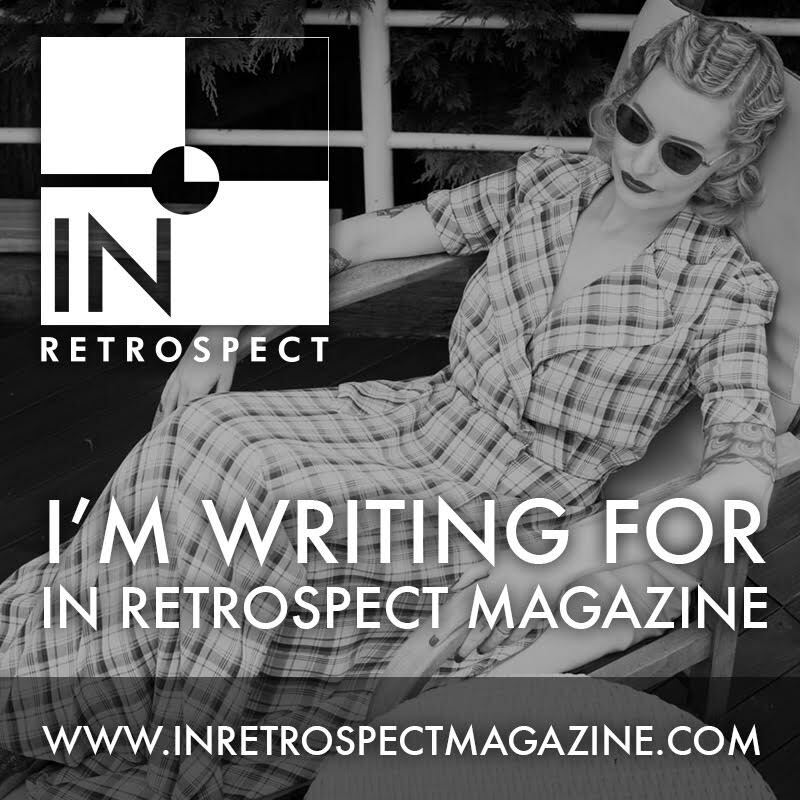 Have you read Malcolm Pryce's noir books set in an alternative, surreal Aberystwyth? They're great fun. I went there to look at their University years ago, they had a great department for what I was interested in and the National Library of Wales but I decided not to go. The drive along that tiny, windy road didn't encourage me much either! I know this place but I'm not sure why...It's going to bug me now. I've never been but after seeing these photos it looks like a wonderful place to visit. How cool! I love the view from the top of the cliff, and that little railway looks like so much fun. Sounds like an interesting place to visit. Such cute little towns! I love the cliff railway. How awesome is that! 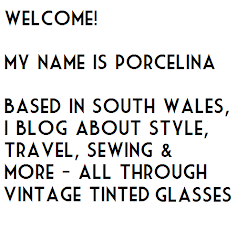 *PS* I adore your coral hued shoes!